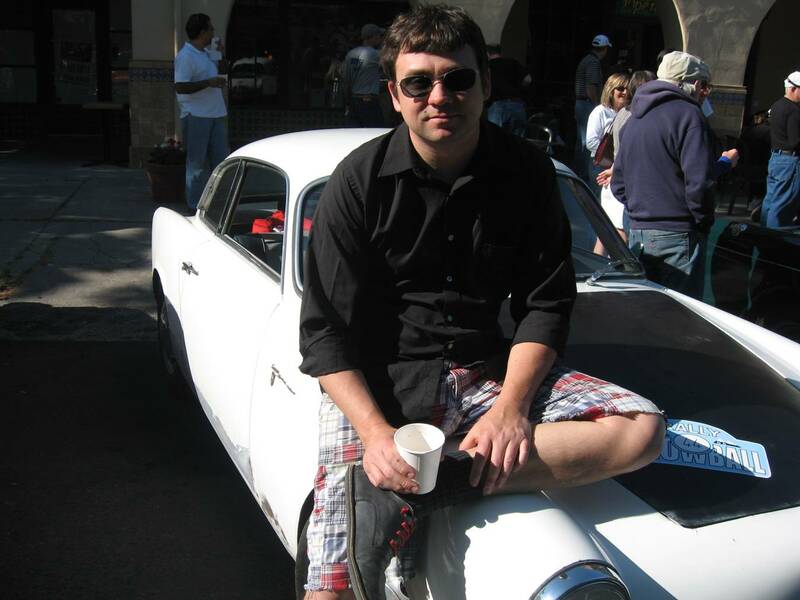 I’ve been messing around with old cars since 1985 and Alfa Romeo’s since about 2001. While I don’t claim automotive repair expertise, my professional life as a mechanical engineer combined with years of fixing old motorcycles, scooters and cars has given me a sense of how things should be. This sense, combined with my unashamed stupid-question asking of my local Alfa experts will hopefully see my 1959 Giulietta Sprint, on the road for years to come. Glad to see you will not be getting into trouble with all of your Alfa projects. site looks good. Very professional site, I hope I may learn from you, I enjoy it! Keep the revs up, and DO use your Giulietta for your commute! Your day will just be better for it…it starts the day with a smile! Matt, Nice site, Great pics, good points and details. Looking forward to additional pages and projects. fantastic site! love the photos! Just want to thank you for an ongoing flow of interesting information on Giulietta’s. It keeps my spirit up in these difficult financial times and motivates me to work on my own Sprint a bit more. I wish you a very nice christmas holiday with a lot of Alfa happiness in 2009! It’s a cold winter night here in Wisconsin and I just found the great pictures of your cool Sprint in sunny CA. Thanks for helping me get through the winter and Alfa withdrawal! Congratulations about tous BLOG! Fantastic! Sorry about that. I’ll correct it. I would like to add my two Alfa’s to your registry. I have had the 101 long door spider since 1987 bought it when I lived in San Francisco. I used to actually commute to work in it daily. 300 plus miles a week. I have been around the 750D short door spider since 1974 and recently got it from my long time friend. He bought it in New Mexico around 1969. Thanks Chris. Odd that they should say Sprint Veloce, Spider Veloce and SS. Sprint and Spider Veloces had 1315*3XXXX series or 00106*xxxxx series. SS’s have 00120*xxxxx or 00121*xxxxx which is what I am using. I think I will stick with the 00121. They confirmed me that it is a 00120. I have a ’58 Giulietta (purchased from Al Leake in Santa Cruz before he died) that we are putting together for vintage racing in N.CA. Having a really tough tie finding dashboard parts – ashtray, radio (face or factor block off), dash-mounted rearview mirror and the original knobs/switches. Although she will be a racer, we want “Stella” to have a very original feel on the interior. Any suggestions where I can get these parts in reasonable condition?? Sprint? Ashtray is tough! eBay has most of this stuff come through. Alfastop/OKparts/classicalfaUK etc has most of it new. Great site and great Melee XIII photos! Thanks!!! You’ve got 20716 listed twice. What’s the missing car? hi, have juswt discovered you and think its fantastic what you do. i have a gtc and am now about (i hope) to buy an ss which, according to your list was black. it is now dark blue (and seems to have been done well as i cant see any other colour anywhere). i’ve raced old cars all my life and never cared about ‘originality’ – but my wife is very worried that this potential colour change would affect the resale value if we were ever to want to let it go. what do you think – any comments gratefully received. I don’t think it matters if the color was changed on an SS as long as it didn’t go to a horrible color/metallic or something and as long as the color change is complete. If they were all kept original color there would be a lot of red SS’s in the world! Mine was red and will be either black or very dark gray. hello again matt – thanks for the rapid reply, it was a great surprise! another couple of questions – hope you dont mind. the gtc is disc brakes and 1600, how different is the response and braking on the ss? i have never driven a 1300 and drum brakes revive memories of panic on mountain passes! i use my cars – the gtc has just done 5000 miles in italy without missing a beat and the ss will be subject to the same. your site is a joy. keep well. Thanks for the praise. What are you hoping to buy? I’ll send you some Vin numbers when I get around to finding the paperwork but I’ve got two ’56 Spiders and a ’57 Sprint as well as the legendary “Crab”. If you would like you could go through the collection sometime, some folks think it is cool. Used to be in the business of old French and Italian cars and still have too many around. My favorite is a 102 spider with a small block Ford mated to the Alfa 5 speed, it’s a kick and will reach a documented 136 mph, previous owner got a ticket. Need to get rid of a 115 berlina and numerous other bits of Italian art, Lancia, Moretti, Maserati, Benelli, Ducati, etc. I have an entire barn full, this is one of those real “barn finds”, really. I also own the Fulvia Dudley, another one of a kind, kinda in the vein of the “legendary Crab” it’s self. The Crab is a c/sr special built by John Cordell in the early ’60s that in Cordell’s words” hit the wall at every track in the country except Willow Springs and Riverside, cause the didn’t have any”. Yeah I know there was a wall at Riverside but he did manage to miss it. Cordell was quite the character, last I heard he was still racing Sprint cars out in the Pittsburg area. I have a couple of his old cars. All the SCCA race cars, Al, Phil , Chris etc from CA were based on the work done to develop the Crab. Don Black called it the mule for Alfa’s production racing in scca. It was last used at a club autocross about 10 years ago and all the class winners went out in it at the end of the day. Ken beat me on corrected time but only because I picked off a cone. A genuine historic race car. Sorry, I do tend to run on. If you would like to check things out let me know, lots of good stories……. I’m restoring a 1971 Eriba Puck, just trying to find all Eriba Puck owners in the US. Do you still have your Eriba Puck? Thanks Matt, I appreciate your response. I am not the owner of the Puck, but will pass the info along. I’ll point the owner to your write up of the acquisition of yours. What on earth is an Eriba Puck ????? Hi Matt ! Good blog ! Shall list my (our ?) 61 spider in it shortly. Graham, thanks for stopping by. Are you planning on working out a Spider sale with Jeff? Eriba Puck is a 1960’s aluminum German camper trailer in a minimalist style. Perfect compliment to your VW combi. Hi Matt: My computer crashed and I lost my link to your site. Glad to be back on it again. I plan on selling my Julie in a year or two and will give Jeff first dibs on it at current market value (I shall check with you first on that). Meanwhile I plan on going on quite a few rides in it this summer to check that it can make that trip out to Denver safely and without problems…. Let me know if you want to make a Julie jaunt. Great Job!!!! Please hold on as long as you can before you start allowing ads. BaT now looks like “Time Square” Don’t take there money. 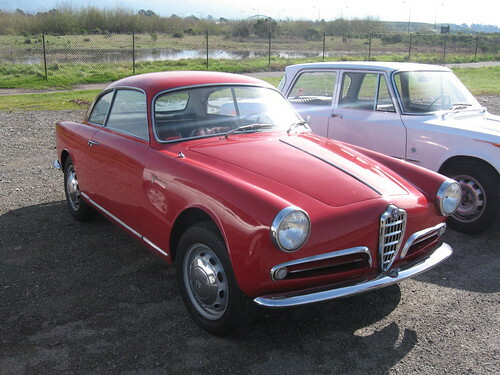 To answer you questions about the 55 Giulietta I would need to know which model it is (I assume a Sprint?) and see some pictures. In general 55’s are scarce based purely on production numbers (~1400 each Sprints and Berlinas, a handfull of Spiders) and being Mille Miglia elligible, command a premium. How many are left? I could better answer that if more owners sent in their cars information. If I had to guess I would say 10 – 30% of production still exists, more likely on the low end of that. First Veloce’s didn’t show up until early 1956. If you had the VIN I could tell you for sure the year and whether or not it’s a Veloce. Upgrades of the sort you describe are common, and do add value to some people. It could even be a race car from the period with Veloce MODs. If you look at race programs from the 1950’s in Italy they just as often say “Sprint” as “Sprint Veloce” or anything else. Some of the SVZ’s were based on Normales that were injured while racing. Enjoy what I have read and seen on your website – lots of interesting tidbits on the Giulietta’s for us possessed Folk out here. Many many kudos to you for volunteering your time. I have been having an affair with my 61′ 1750 abnormally spider for a few years now and would like to add a sprint to keep her company. Your site should help me in that quest. Keep it up! Thanks Mr. Flyer. I think we’ve exchanged emails upon a time. Thanks for stopping in. My 59 Sprint has the centerline adapter with Ate brakes. If you can get good used brake parts it can be economical. Is there a problem with your drums? You will have to replace the master cylinder with one of a smaller diameter -out of a Duetto will work- to get the right mechanical advantage. This wasn’t done in my Sprint (previous owner did the conversion) and it stops well enough but has no pedal feel and is not confidence inspiring. I have considered converting back to drums but it is one of those back-burner projects with my SS and all. Matt, This may be a bit late , but thank you for your thoughts concerning adapting disc brakes to my 59 Giulietta Spyder. Very helpful. Think I’ll stay with the drums, which are basically OK to begin with. Thanks for all the good Alfa stuff. I am an owner of an all original late 1957 Giulietta Spider since April 1958 that gave me great pleasure driving it for almost 53 years. 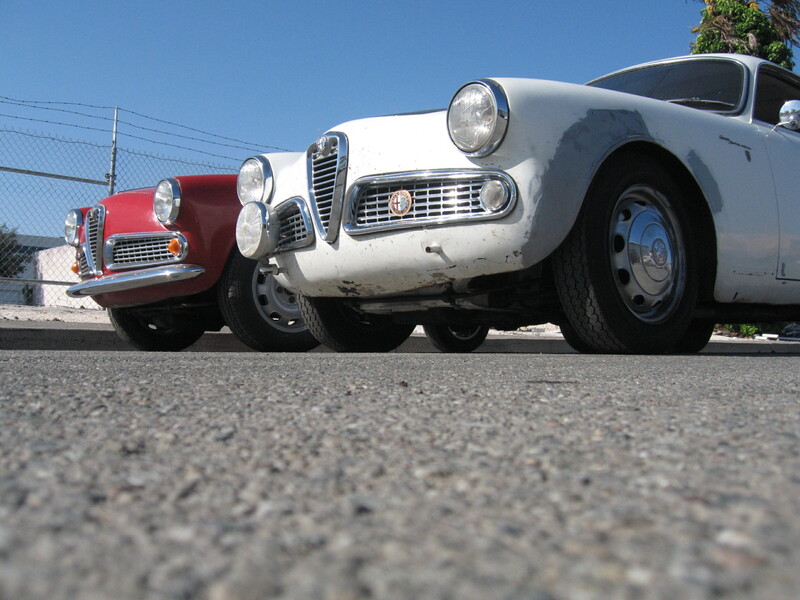 In April 28, 2010 I will celebrate 53 years withe my Giulietta. Che una bella macchina. I believe OKP and Alfa stop and Classic alfa UK stock front bumper pieces. Original is chrome over steel. Would you be able to offer any ideas as to how I can permantly locate the Rocker cover gasket on my 101 Spider. It receeds every few months at the front and covers the engine bay with iol. Should I glue it to the cover first? Great site, something new almost every day! Thanks for visiting the site. I have seen a discussion about this problem on the 750/101 yahoo group and the concensus seems to be that some small dowel locating pins would do the trick. I think the idea was you drill 2 small holes in the head or valve cover, install the pins then have them stick out from the surface enough that holes drilled in the gasket would key it to these pins. Search their archive on this. It was a recent discussion. Matt, every time I get overwhelmed by the magnitude of the job of restoring my Sprint, I read one of your blogs for encouragement. You have been amazingly gutsy in some of the projects you’ve chosen. Thanks! Hello and Good Morning. I just purchased the car I have lusted over for many years. No leaks, not hits, no runs etc. I have this car listed in the register. Where are you? 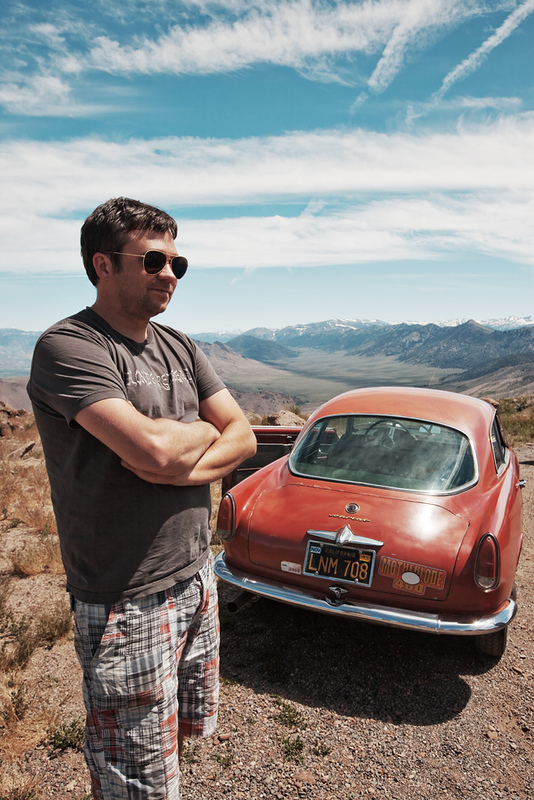 Matt – just found this website today, and was surprised to see a partial listing for my car (1964 Spider #379676). Your entry shows Japan, which is indeed where I live, but the car is still garaged in Oregon. If you like you can add the EN (00112*15215) and I will send you photos if you tell me how. I plan to sell the car soon, after owning it for 34 years. To claim this discount all you need to do is add the code into the basket during the purchasing process. This coupon expires May 22, 2010. We would be grateful if you could add this news to your website. Please, let me know something about your decision, also if you would not decide to insert it. About the list of giulietta spider veloce,i must correct a big lie.The Giulietta type 750G AR1495 G*00311* it isn’t scraped as described,but in mint condition after 6 years of work restoration.Original engine AR1315*30715 buied from me in Massachussets,Manchester on 2005.Now in Roma.Car is visible on giulietta register site by Christofer Boles. About Giulia spider normale vin 377563,was restored when i was the owner and sold on 2008 in Montecarlo. About Giulia spider veloce 101.18,i’m the owner of 390217 and engine 00121*01617 buied in USA from Velez,Texas.Now in restoration since 3 years,near to be finished. About Giulietta sprint veloce 750E vin 01849 and engine 1315*30046,i’m always the actual owner.Car buied several years ago,totaly destroied,saved only the chassis,now under an hard restoration working since about 6 years and rebuilt as a SV lightweight not more an SVZ.I think again several time before it will be ready to come back on the road,cause the disperate search of many spares lost. These and others important giuliettas and giulia,including SS,SZ and ti super,all in my private collection. Thanks for the updates. I t sounds like quite a collection. I’ll update my register. Ciao Matteo,please,let me know how i can do to send you some pictures to post on the site. Grazie for the reply and the interest,Luca. Dave, I don’t know where you are, or which model. I am in the Palm Springs area, and my 59 Sprint is out being blasted. Will be back here in 10 days. It is pretty much intact. Hello, I live in France and hown a Sprint 750B since 1 year. I read your blog with allot interest, and watch good pictures of original car. My lovely Giulietta n° 1493 09957 was made in 07/1959 and sold in France. It’s in red original paint, the body and the interior is original and untouched very good condition (the passenger seat and door panel are like new). I can send you some pictures to joint in your blog if you want. It could be a good support for many person who like to see the original configuration. Do you have an engine number for me? I was curious as to why you don’t have or feature any spiders. Just brought my first Alfa, a 1969,1750 roundtail, in very nice condition, and now the understated elegance of the Giuliette spider has caught my attention. Started out with Porsches where coups are more desireable than cabrios because of the stiffer body. Is this true with Alfas? Also, what would be a price range for an upper end daily driver Giuliette? I’ve posted some Spiders -the current post is a Spider that was on eBay. Just sold this Oregon car for $25K. Not perfect but darn nice. Just found your website. I see you have my old spider listed. AR 390164, ’64 Giulia Veloce. I bought it new from Webb Motor in Berkeley CA in Nov ’64. they titled it as a ’65. Still have pictures and the original bill of sale. I sold it long ago, wonder where it is. I have it listed on Bowles? website. Since then I’ve owned 4 other Alfas, most recently a nice ’86 Quadrifoglio, (thats gone now too). Sorry the link above doesn’t work. It was a ’64 Spider normale, white, original no rust. Very professional site, I hope I may learn from you, Keep it up. Nice to meet you yesterday. We moved one step forward but now expect two steps back with the motor. ( Piston to valve and head clearances seem perhaps too close. Ouch.) Thanks for the T-shirt; the design is terrific. When the motor is finished and back in the car, we will get some Sprints together. Enjoyed browsing your site very much. I will forward numbers etc for my Sprint. MATT, Just saw a restored Glas FOR SALE HERE IN CONCRETE WASHINGTON ALONG WITH A PARTS CAR. WAS THIS THE ONE YOU BOUGHT? IF NOT THAN THERES THIS PAIR AT GIORDIANO VINTAGE MOTORS AND YOU MIGHT WANT TO LOOK IT OVER. PAUL,61 SPYDER-1400cc & 59 VELOCE SPRINT. Added it last night after I got your email. I buy this week à Giulia SS 1963 in Italy. I can sent you à pictures i you want and the details. I would be hard pressed to tell you where I found the number of your car. If it sold in the last 5 years, perhaps there. If you are on the AlfaBB and mentioned it, perhaps there. If you joined the 750/101 Yahoo group and published it there, perhaps there. Regarding history, it’s hard to put together what has been taken apart if no traces remain. John De Boer, who posts on the AlfaBB occasionally may have some info -I suggest asking there. Also, I have heard you can go to the agency in Italy that handles car registrations and have them give you the registration history of a car, but I believe you need the Italian license plate number. newer/better? This 59 Giulietta 750 is not charging, and I am exploring options. I suspect the regulator is no longer working. Looks like a nice car. I had to do the same job but used a stud puller and a 10mm phenolic block I stole from a Giulia TI. Is it possible to do a frame off resto on a unibody car? unibody. I was not involved in the restoration of this car. Although I’m registered with your excellent site I’ve not received any Giulietta postings for at least a year? Is it poss to check-out why? Interesting register. Uncomplete of course. Why don’t you list the FUSI register, it includes all chassis number/ year. Or do you only register the ones currently alive ? AR 167953 : Giulietta Spider Veloce (101.07), manufactured on the 16th November 1960 and sold on the 13th February 1961 in France. Is it currently under restoration but I was driving it for the last 17 years. Hello, I have a long story and currently working on the restoration of my late uncles 62 Giulietta that he bought in 1967. It has a 1315 motor in which i am sctaching my head. It has the older distributor(Pre 1962) and 10102 exhaust manifolds. I spoke with him alot regarding this car and he never replaced the motor though it could have happened in the 5 years before he bought it I guess. I posted picts and trim tag infomation shown below. Well….I pulled the trigger on this over the weekend. (gulp!). It should arrive next week…straight to Santo’s in Northridge CA for a review & estimate on what’s needed. Hoping to be able to drive it this summer. I probably overpaid, but I don’t care.